Any new police vehicle entering the market must measure itself against existing models in a crowded field. It must perform up to the task of pursuing subjects on various terrains at higher speeds and in dynamic situations. For law enforcement agencies that purchase the vehicles, the process must go beyond the marketing claims made by manufacturers. 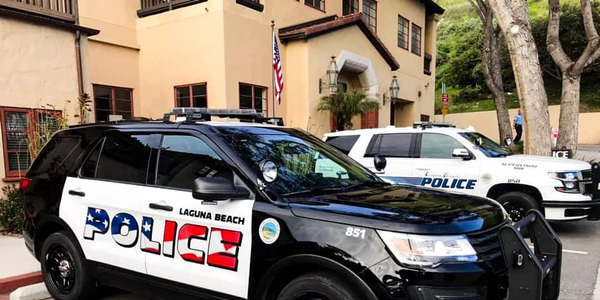 Each fall, law enforcement agencies in Michigan and California provide such a measuring stick in the form of extensive police vehicle testing that's designed to provide unbiased data to those purchasers. 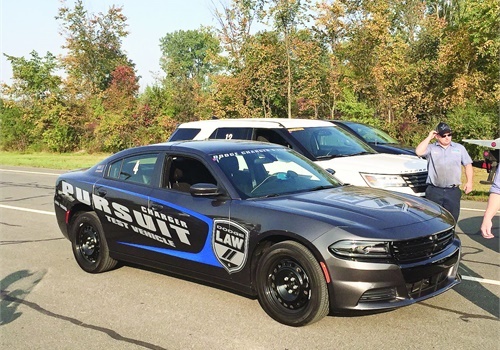 The Michigan State Police in September, then the Los Angeles Sheriff's Department in October, run these vehicles through a battery of tests for acceleration, top speed, braking, dynamics, and ergonomics. The agencies then produce comprehensive reports. The process also provides feedback to manufacturers to help them make their products more competitive. "A new vehicle entering the marketplace wants to be compared against all of those, because it’s a pretty big sales tool for all of the manufacturers to say, 'Hey we're going after the speed, carrying capacity, that type of thing,'" says Lt. Mike McCarthy, who oversees the Michigan testing as commander of the Precision Driving Unit. The market for pursuit vehicles has grown since the days of the Ford Crown Vic Police Interceptor that was retired after the 2011 model year. Ford is offering its Police Responder Hybrid Sedan and F-150 Police Responder pickup—the first gasoline-electric hybrid and large pickup put through the testing—and Yamaha is introducing its FJR1300 sport touring motorcycle. These three vehicles have been confirmed for the respective lineups. A fourth vehicle tested in Michigan, a pursuit version of the Dodge Durango, may be offered in 2019, say Dodge law enforcement associates who brought that vehicle to Michigan. Let's take a closer look at the crop of sedans, SUVs, and a pickup truck offered by various manufacturers as 2018-MY vehicles. Ford brought two unique police pursuit vehicles to the testing. One is a pickup truck that offers off-road and towing capability and the other is a hybrid sedan. 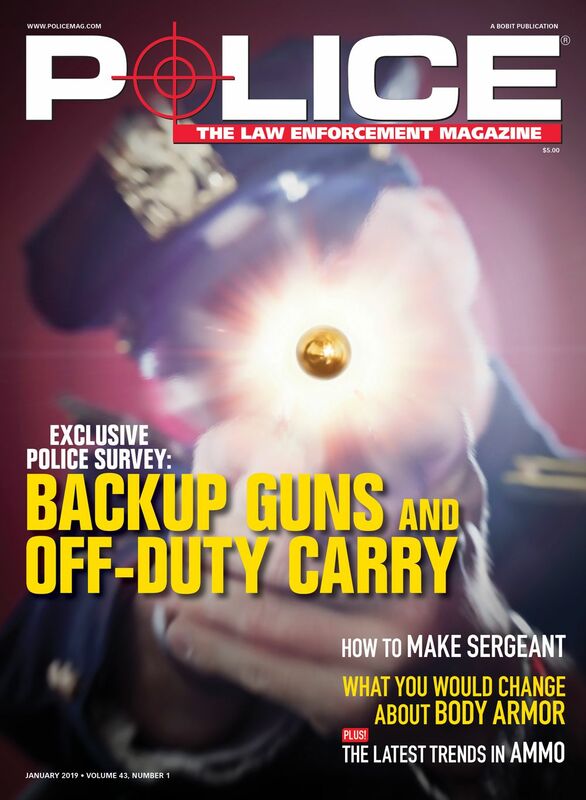 While high-speed performance may not be the first thought, the vehicles are designed to perform in a pursuit, says Steve Tyler, Ford's police fleet marketing manager. "We do expect to see some use in cities and towns," Tyler says about the F-150 Responder. "Where we expect the majority of the use is where agencies need an on-road pursuit vehicle and off-road capability." 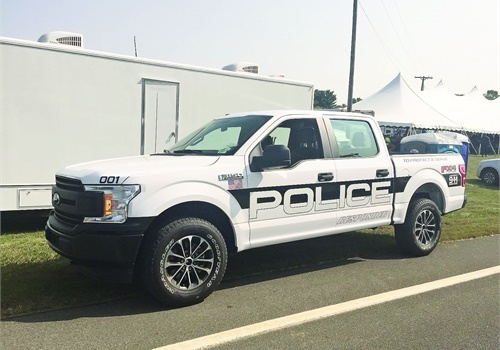 The F-150 Police Responder, which is powered by a 3.5-liter twin-turbocharged V-6 engine, reached a top speed of 100 mph in eight laps at the FCA Proving Grounds in Chelsea. It reached a zero to 60 mph time of 6.3 seconds and a 0 to 100 mph time of 16.1 seconds. While top speed was the lowest among the 14 four-wheel vehicles tested, the truck's speed increments surpassed other vehicles. Its zero-to-60 time was fourth. From zero to 100 mph, the vehicle placed fifth. In brake testing from 60 mph to zero, the truck needed 142.96 inches (11.9 feet) to reach a full stop. It ranked 12 of 14 in that category. 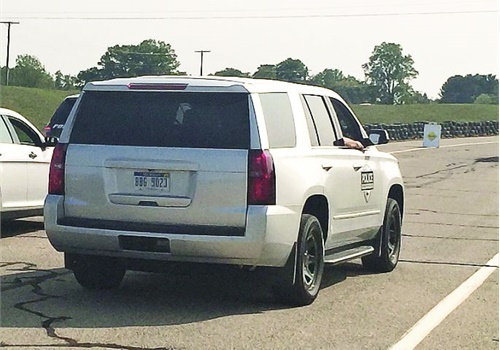 In vehicle dynamics testing at the Grattan Raceway in Belding, the F-150 Responder averaged 1 minute, 47 seconds over four laps (1:47.34), which was 14 out of 14. Ford's Police Responder Hybrid 2.0L reached a top speed of 119 mph. It reached zero to 60 mph in 9 seconds and zero to 100 mph in 23.1 seconds. It was 14 out of 14 vehicles in those increments. 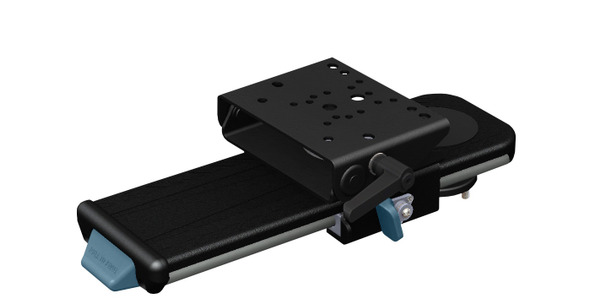 In brake testing, it needed 136.16 inches (11.3 feet) to stop, which was ninth. In the vehicle dynamics testing, the gasoline-electric hybrid averaged 1 minute, 45 seconds (1:45.91) over the four laps, which placed 12 out of 14. The MSP also tested six carryover models from Ford, including the Police Interceptor sedan with the 3.5L EcoBoost (in all-wheel and front-wheel drive), P.I. sedan with the 3.7L V-6 in AWD, P.I. sedan with the 2.0L EcoBoost in FWD, P.I. Utility with 3.5L EcoBoost in AWD, and P.I. Utility with 3.7L V-6 in AWD. Fiat Chrysler's Dodge unit brought a Dodge Durango, which could be offered as a 2019-MY pursuit vehicle if all goes according to plan. Dodge representatives attending the Michigan testing declined to provide full details about how the vehicle is different from the 2017 Durango Special Service. Both vehicles are powered by a 5.7-liter V-8 engine that delivers power via an eight-speed transmission to a rear-wheel or available all-wheel drive system. Dodge will release more details later this year. "It's a rear-wheel-drive vehicle with an all-wheel drive option," says David Callery, FCA's program manager for police and emergency response vehicles. 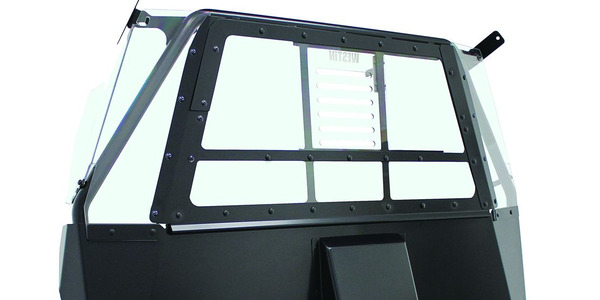 "To get through the tests, the vehicle has to hold up to the rigors of daily patrol. We believe it's equal or superior to the other vehicles out there." The Durango V-8 with AWD reached a top speed of 120 mph, zero to 60 mph in 7.1 seconds, and zero to 100 mph in 17 seconds. It was sixth in zero to 60 mph and sixth in zero to 100 mph. In brake testing, the Durango needed 133.94 inches (11.1 feet) to stop, which was fifth. In the dynamics testing, the Durango averaged 1 minute, 42 seconds (1:42.10) over the four laps, which was 11 out of 14. For 2018, Dodge will offer several upgrades to the Charger Pursuit, including an enhanced Office Protection Package that alerts an officer about someone approaching the rear of the vehicle as standard equipment. FCA is upgrading the dashboard display to 7 inches (from 5 inches) and adding Apple CarPlay and Android Auto on the Street Appearance package. A rear backup camera now becomes standard equipment. The Fleet Safety Group that includes a blind spot monitor, rear cross traffic alert, and Rear ParkSense will be offered as a no-cost option. In addition, the rear camera can now remain active at up to 8 mph or 10 seconds and can be turned on at higher speeds. Two Chevrolet vehicles went through testing—the Tahoe PPV 5.3L in rear-wheel and four-wheel drive. The GM unit has pared back its pursuit offerings, after discontinuing the Caprice PPV and Impala Limited, to focus on higher-demand SUVs. "The Tahoe PPV is a proven vehicle that we've had for several years," says Dana Hammer, product and marketing manager for law enforcement vehicles. "We have technology upgrades for 2018." For the 2018-MY, Chevrolet will offer the optional Enhanced Driver Alert Package with its Tahoe PPV that includes automatic braking, collision alert, lane keep assist with lane departure warning, and Safety Alert Driver Seat. Chevrolet will also add an 8-inch diagonal touchscreen with a backup camera, Apple CarPlay and Android Auto, Bluetooth connectivity with voice commands, and steering wheel controls. 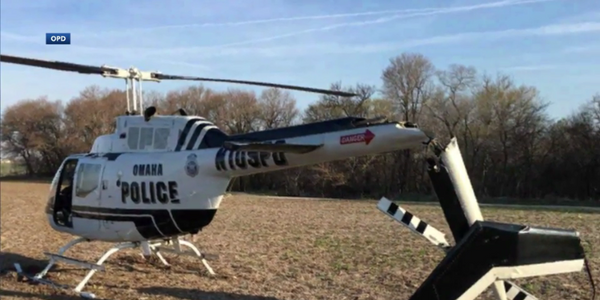 This year's testing brought several new categories of vehicles that may cause the law enforcement evaluators to rethink their testing. While no changes were made for this year, a gasoline-electric hybrid may require additional data points. "With the hybrid, they're going after alternative fuels and fuel mileage," McCarthy says. "That car may not be as a fast as some of the other sedans, but it's obviously going to have better fuel mileage in the long run than anything else." The agency also expects to test battery-electric vehicles in future years. "We're not expecting the same results out of them, but it does bring up the question that in the future, if we go fully electric, is this the best test," McCarthy says. "We don't report our fuel level [after the testing]. That may be good to know." Paul Clinton is the senior web editor for Government Fleet and its sister publications.